The City of Vancouver is pushing ahead with plans to create more charging stations for plug-in electric cars, even though there are only a handful of the electric-only vehicles in the city. Mayor Gregor Robertson is expected to unveil the city’s newest station at a public parking lot near city hall on Tuesday morning. The project, which is the first of its kind in B.C. is designed to assess the viability of commercial charging stations installed at several EasyPark lots throughout the city. 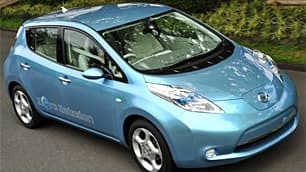 John Stonier, the spokesperson for the Vancouver Electric Vehicle Association, estimates there are 20 fully electric cars on Vancouver roads. He says the single biggest reason there aren’t more electric cars on the road is because local car dealers haven’t made them available. But he says it’s still important to start building charging stations for the future, in parking lots and in residential buildings. “We build buildings to last hopefully hundreds of years, and we have to have these buildings have the right energy supplies for the energy of the future, which will hopefully be electricity, and not fossil fuels,” he said. The Nissan Leaf electric car will be available in B.C. in the fall of 2011, the company said in March. Plug-in vehicles are different from most hybrid vehicles, because they can be plugged into a power source to charge up the batteries, although some include gasoline engines.